Twenty minutes and $20 later I was heading home with this slightly used car hood. I forgot to ask the make and model, so enamored was I by its smooth, slightly curved shape and the built-in tapers. Now this, I thought, is something I can make a Spyder fuel tank with. And it works well enough I suppose but not really as well as it should. The filler is too low to get the tank all the way full, for example—and it’s about five inches south of where it would be on an original Spyder. I covered a bit of this ground previously here. It took a lot of work to move the filler five inches. 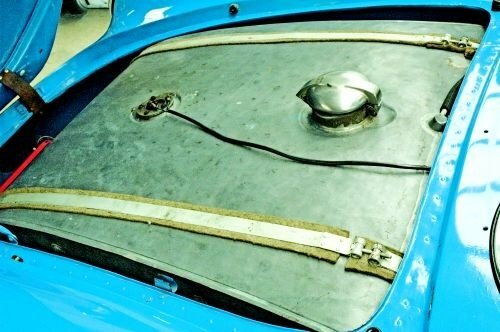 It involved welding and drilling, welding that could not be drilled, a friendly machinist, and finally more welding before the regular and standard tank clean-out and interior coating and paint came about. But even with the tank modified to put the filler in the right spot, it still looks (here it comes) nothing like what the 550 actually had. I painted mine hammertone silver but that didn’t really change its shape much. The thing to do, I thought, would be to cover the tank with a new skin—and make the edges of the fake tank hinge out so as not to totally waste the space. A bit of CAD told me I needed a bigger piece of sheet metal than the Despot or other common suppliers could give me. And there we stalled, since last July, while I worked out the details in me noggin. The brain wave: use the “hold down straps” to hide the seams. Hinge the side pieces in front, fix the middle piece with screws, use cabinet catches—magnets should work—to keep the bits shut. Line everything with felt or something like it to keep the parts from singing while underway. With luck and ingenuity we should be able to keep a California duster under one side, quick wax and sham towels under the other, and a usable tool roll under the front/center bit. With suitable material in hand I started cutting. . . I decided to make it in three pieces, so I cut the side bits off. Then I made a crude flanging tool out of plywood, particle board and some threaded rod, to get the correct crater for the filler neck to emerge through. Today after work I hammered out those wrinkles, made a second, smaller flanged circle below it for the fake sender to sit in, and ground some of the paint off before getting out the bead roller. After that I cut the hole for the filler. The rough shape is coming along nicely, but I figure it’s going to be tough to get it all to lay down smooth. I’ll have to relieve the tank in the back for the frunk latch, for example. And the real tank sits a bit high on the passenger side, so it might be a bit tight to stack a second “tank” skin on top of that. Making it all work is going to be tricky.